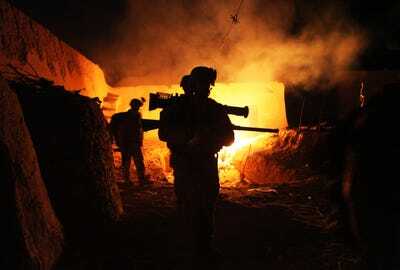 Combat troops are scheduled to leave Afghanistan in 2014, effectively marking the end of the war. 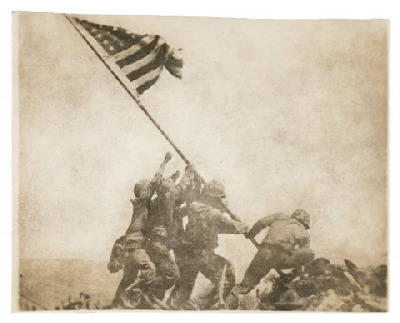 President Obama has pledged that all US troops will be out of the country by 2016. 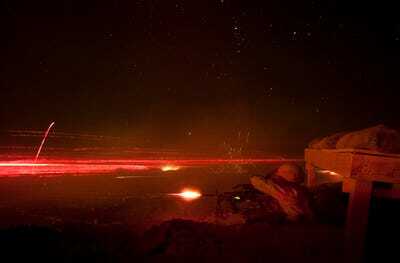 However, Marines, Army, and Navy continue to train and stay battle ready. 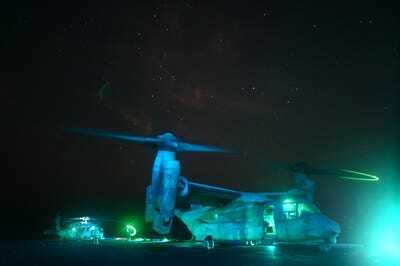 The following night photos, drawn from the U.S. Marines, Army, Air Force, and Navy show just how cutting-edge our military has become. 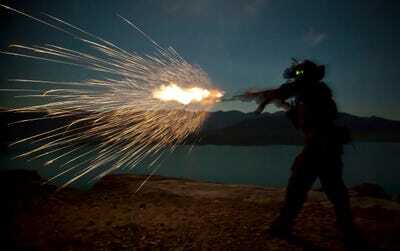 Inspired by similar images posted by Foreign Policy, we have prepared our own gallery including a few more exclusively from military photographers. 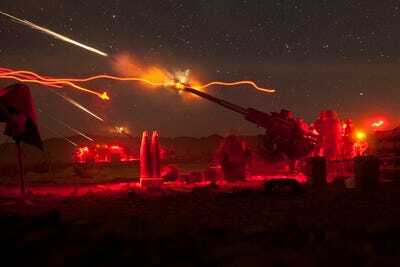 U.S. Marines with Lima Battery, 3rd Battalion, 11th Marine Regiment, fire M777A2 Lightweight Howitzers during exercise Steel Knight in California. 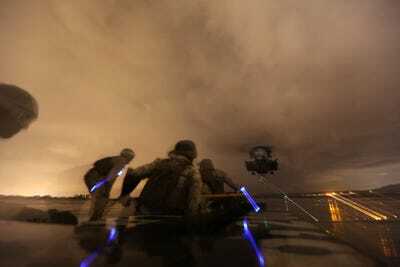 Marines participate in an external load lifting exercise with a CH-53E Super Stallion helicopter. Machine gunners with Lima Company, 3rd Battalion, 3rd Marine Regiment, illuminate the night sky by firing tracer rounds and then reloading their weapons at a training exercise in California. 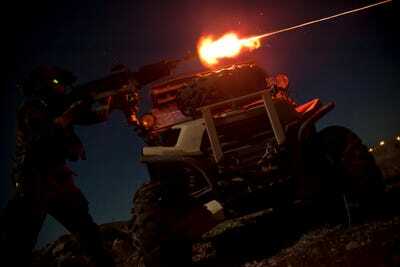 A machine gunner fires an M240 machine gun during a night squad-attack exercise. 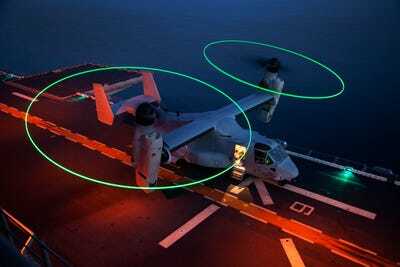 An MV-22B Osprey prepares to takeoff aboard the USS Kearsarge, while sailing off the coast of North Carolina. 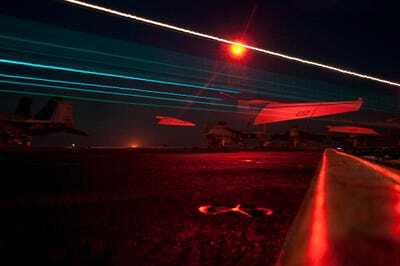 An F/A-18F Super Hornet from the Jolly Rogers of Strike Fighter Squadron (VFA) 103 launches from the Nimitz-class aircraft carrier USS Dwight D. Eisenhower. 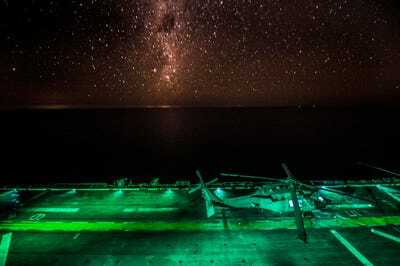 An MV-22 Osprey prepares to take off from the flight deck of the amphibious assault ship USS Kearsarge. An MH-60S Sea Hawk helicopter is readied for launch during flight operations aboard the amphibious assault ship USS Bonhomme Richard. 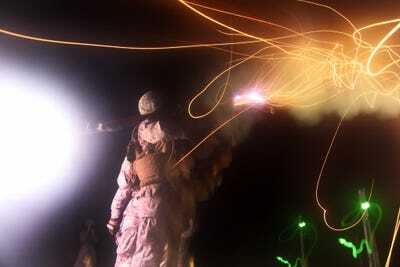 Flames light up the sky as a Marine launches a Stinger Missile at a flying drone in North Carolina. 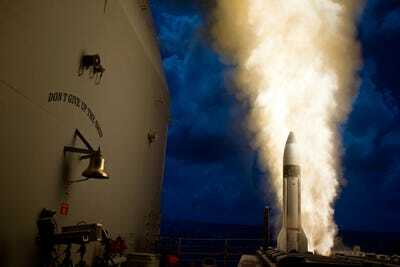 An SM-3 Block 1B interceptor is launched from the guided-missile cruiser during a Missile Defence Agency test. 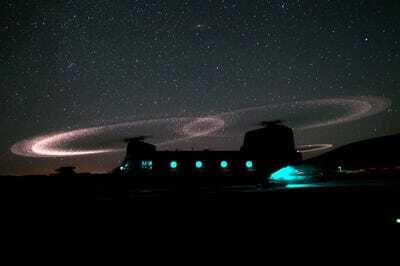 Dust lights up the rotors of a CH-47 Chinook helicopter as paratroopers load for an air assault mission near Ghazni Province, Afghanistan. 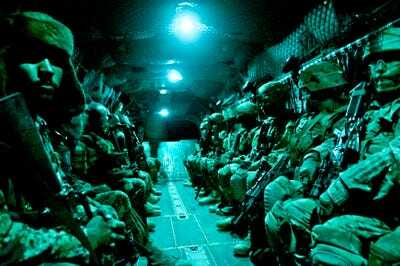 Paratroopers with the 82nd Airborne Division's 1st Brigade Combat Team and Afghan National Army soldiers aboard a CH-47 Chinook heavy lift helicopter during an air assault mission in Ghanzi province in Afghanistan. 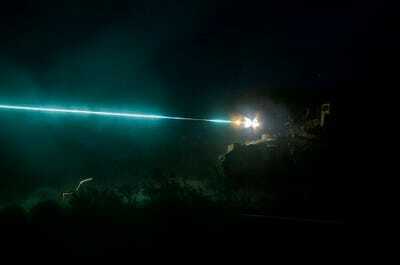 A U.S. Army M3A3 Bradley Fighting Vehicle from the 3rd Squadron, 1st U.S. Cavalry Regiment, Fort Benning, Ga., practices night-firing at Fort Irwin in California. 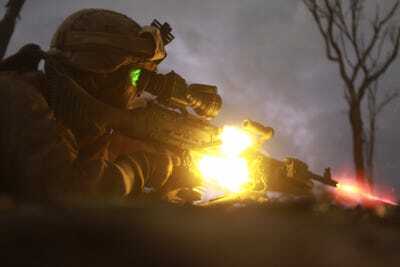 Marines with Scout Sniper Platoon, Alpha Company, 1st Battalion, 1st Marines, Regimental Combat Team 6, leave a compound in Agha Ahmad, Helmand province, on Aug. 27 as a part of Operation Helmand Viper. Want To See More Of The Military?